Instant apple oatmeal packets make this recipe for Apple Oatmeal Amish Friendship Bread fast, easy and nutritious. Thanks to Kitchen Friend Nancy Munson, who shared this recipe with us! 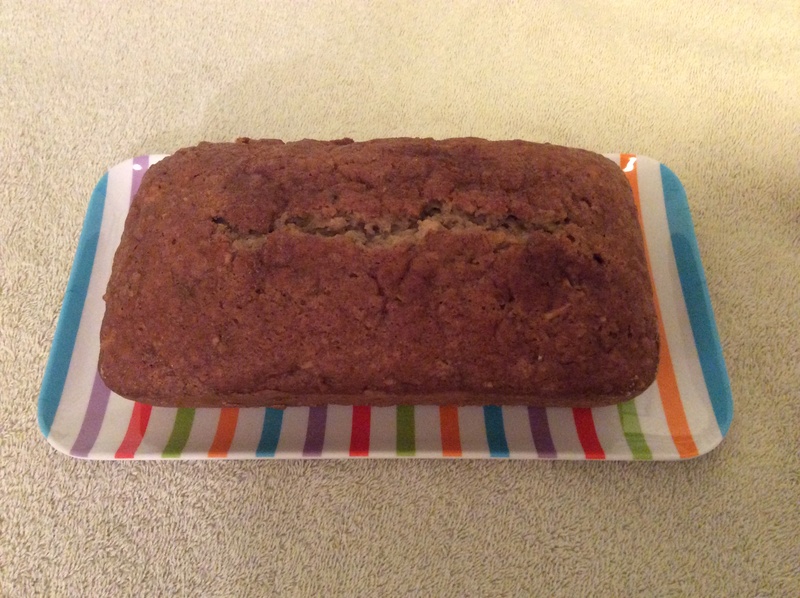 Instant apple oatmeal packets make this recipe for Apple Oatmeal Amish Friendship Bread fast, easy and nutritious. In a large bowl, cream starter, eggs, oil applesauce and milk. Fold in chopped apples and walnuts. Divide between two loaf pans that have been sprayed with cooking spray and dusted with flour. Sprinkle cinnamon and sugar mix on top of each loaf. Bake for 45 minutes or until toothpick inserted in the middle comes out clean. I’m wondering what the obsession is with adding pudding mix to all the bread recipes? Not caring for pudding mixes– will it do anything to my bread to leave it out, maybe leaving out an equal amt. of the flour called for in the recipe? I’ve always skipped recipes that used pudding mixes but I’d like to try some of these. Do you after the initial 10 day making of the starter put the starter into the refrigerator? Some people were calling this recipe Herman, but this isn’t the same thing at all, close but no cigar. They can interchange Herman’s recipes with this Amish Friendship starter though with no problems. I have the AF starter on my counter percolating away and have already made a tried and true biscuit recipe with it. I made it using the 6th day feeding and it was really good. After the flavor develops it’ll be that much better. It’s like eating a long lost memory. Hi Sy! Don’t add flour, just leave out the pudding mix or try one of our homemade pudding mixes. As CabotMama says, the pudding boosts flavor and it also helps keep the bread moist, but lots of people (including me) have made recipes without the pudding altogether. The only catch would be a flavorful recipe (like pumpkin spice) that relies on a flavored pudding mix. You would need to substitute with the right extracts and spices to get it right. Thanks for the great question and sorry for the delay in getting back to you. Good luck! I have made several of these recipes and have omitted the pudding mix each time. The bread is delicious as is. I also use a three to one ratio of applesauce and oil: 3/4 C applesauce and 1/4 C oil. Plenty moist. Some of these recipes rely on the pudding mix for the flavor. For example, a coconut recipe with no coconut – just coconut pudding mix. I’ve altered the recipes by adding coconut flakes, yet the flavor was lacking. For recipes calling for vanilla pudding mix, a little extra real vanilla extract seems to do the trick without all the artificial stuff in those pudding boxes. Thank you for the tip about the Herman recipes. I’ve wondered if they are interchangeable. So I can use the AF starter in a Herman recipe? I’ve seen different variations of the Herman recipe so I can’t say for sure, but my general sense is YES (in terms of it being interchangeable). And you’re right about the pudding, though it helps with moisture as well as flavor. Another option is to try our homemade pudding recipes — we have three in our Recipe Box. Hope this helps and happy new year! I used the homemade puddings and they are great! Thanks for sharing no-pudding info as I don’t always like to add it either. The homemade is perfect & easy to make. Hi Christine! You can find all of our homemade pudding recipes here. Happy baking!